Love and Lavender is honored to feature the work of so many talented photographers and other wedding professionals. 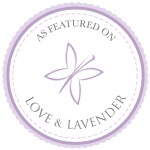 If your work is featured on Love and Lavender, feel free to download a badge to display on your website. You can also link your website audience to your feature URL on Love and Lavender so that visitors can see your work!